It’s very difficult to go through the experience of being on television in front of millions of people, be thrust into the music industry to churn out a record and remain true to oneself. It’s challenging enough to do this in the world we are living in — to not only uphold your own values amidst conflicting influences, but to lay them bare for others to criticize is a powerful thing. This is the kind of vulnerability Colton Dixon displays on his fourth studio album, Identity, which released last month and tries to make sense of the most intimate details of our minds, bodies, and spirits in an world that often seems senseless. When Dixon’s post-American Idol debut album, A Messenger was previously reviewed, it was noted then that despite the religious themes on his album, listeners would not necessarily have to call themselves Christians to be able to relate to those themes. This is something that Dixon has always been able to accomplish with ease, whether back then or now on Identity. With Identity, Dixon uses the additional six tracks on the deluxe edition to add three tracks entitled “THE MIND,” “THE BODY,” and “THE SPIRIT” (the album’s respective “sections”), which explain how these aspects of the human experience factor into our identity. The metaphors heard in “THE BODY” are especially powerful in light of the goings-on in the world today. The voice-over Dixon chose speaks to how a body has many parts and each part has a different function, similar to how each of us are different and society could not function without those differences. The track ends by comparing each of us to a part of Christ’s body, which explains Christianity’s core values of not judging people for those differences and loving and respecting them in spite of those difference. “THE BODY” then transitions into a hard-hitting rock track called “In My Veins” that isn’t featured on the standard version of the album and is arguably one of the best tracks on the deluxe version in my opinion. It has an epic driving quality to it that wouldn’t be out of place if it was the overture for the climax of a movie or video game. This rock vibe continues throughout “THE BODY” section of the album with tracks like “Warriors” and “Down,” which fans of Imagine Dragons and Evanescence, respectively, will certainly appreciate. “Human,” the last song in “THE BODY” section, might be my personal favorite on the album because of how acutely it targets our human vulnerability and reminds me that it’s okay to have weak moments. 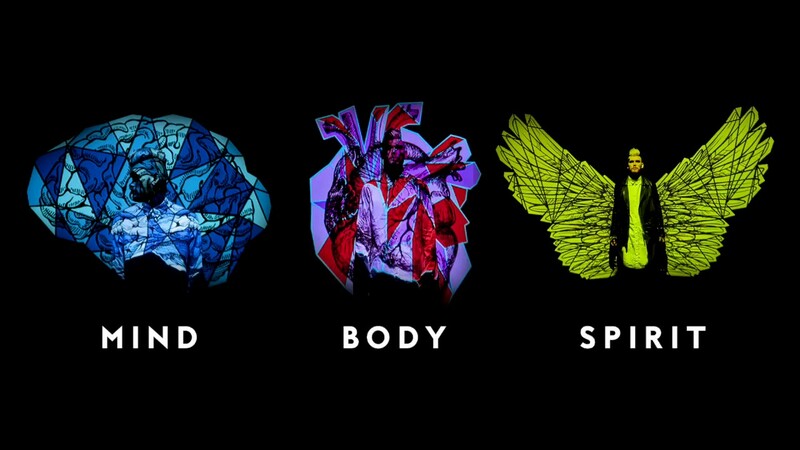 Visual depictions of the three sections – Mind, Body, and Spirit – of Dixon’s new album, Identity. [Credit: 19 Entertainment, Sparrow Records]. But despite Dixon’s Wikipedia profile classifying him as a “Christian rock,” the singer knows how to test the limits of that label. In “THE MIND” section, Dixon embraces his penchant for pop with two of the albums singles (“All That Matters” and “Brand New Life”) framed by two equally infectious tunes (“Identity” and “Technicolor”). “THE MIND” track, followed by those tracks, makes for a strong start to the album that would sell just about any skeptic on Christian rock. Which, as said in our review of Dixon’s first album, is something that he has always tried to achieve. The singer knows that there is no sense in polarizing people with different beliefs than his and, in fact, doing so would only hurt his message since Christianity has always been about sharing that message with those who need it. Dixon’s music is motivating and non-secular listeners can relate to it in a lot of ways because, especially with Identity, it simply speaks to the human experience. No where is this more obvious than during “THE SPIRIT” section of the album, where Dixon focuses on the emotional aspect of our being. Particularly, in “The Other Side” which the singer released before the album and told fans that the song was deeply personal for him and his wife, Annie, who lost her brother shortly before meeting the singer, and one that he hoped would help his fans heal the grief of losing a loved one, as “Scars” had done for many people on his first album. The tracks in “THE SPIRIT” section even have a different sound to them compared to the other two sections. While “No Greater Love” is another example of Dixon’s ability to produce a song that will get stuck in your head, “Breathe,” “High” and “Autopsy” (another one of the bonus tracks), are down-tempo tracks that really benefit those who listen to the lyrics and feel what Dixon must have felt writing them. The three sections of the album — THE MIND, THE BODY, and THE SPIRIT — do an incredible job of creating a concept album that works both on the standard version as separate tracks and on the deluxe version as a cohesive whole that tells the story of what it means to be human. As noted in the review of his first album, Dixon’s work can be applauded. His ability to make music that Christians and non-Christians alike can relate to, while finding creative ways to bring the truly universal values of love, respect and non-judgment to his otherwise great, diverse tracks is commendable and definitely inspiring. Dixon’s new album, Identity, as well as his other four albums are available for purchase on iTunes, Google Play or, if you want a hard copy, on his website, as well as for streaming on Spotify or Apple Music. If you’ve heard it, let me know what your favorite tracks from the album are in the comments below! ← Happy Easter from The Hudsucker!